Hardware & Tools | Do-It-Yourself Advice Blog. What Do I Need to Start Upholstering? 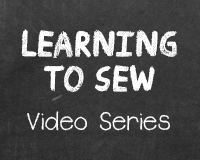 At Sailrite, we want to help equip DIYers for any sewing project you want to take on. 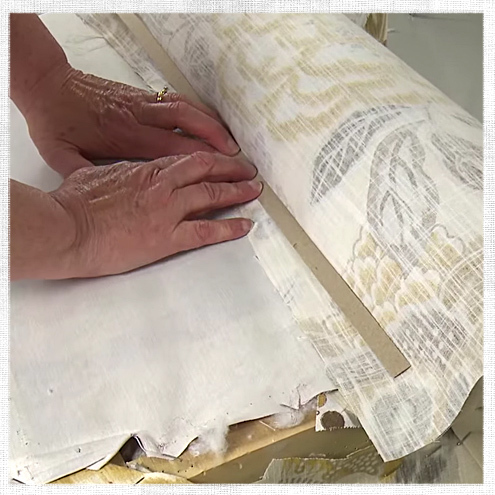 If you’re interested in learning how to upholster, we have great videos that will walk you through the process of upholstering a variety of furniture pieces step-by-step so you can learn as you go. Before you start your first upholstery project, we recommend stocking up on a few useful tools that will make your job much easier. There are a lot of specialized upholstery tools that you can invest in later if you want to continue upholstering, but for beginners we recommend a kit of mostly basic sewing supplies with a few specialized tools. We worked with our staff upholstery experts to create this list to help you get started. So here are our top 8 beginner upholstery tools, in no particular order. 1. Sewing Machine: Although upholstery is a lot of pulling and stapling, there is often sewing involved as well. Sew up your own custom piping, new covers for seat cushions and more with a good heavy-duty sewing machine. Upholstery fabric assemblies can get pretty thick and the Ultrafeed LS-1 Sewing Machine will walk over them all without issue. Ultrafeed Sewing Machines also all feature a built-in welting tunnel in the standard foot, so you can sew 1/4” piping without changing the foot. 2. Pneumatic Stapler: An upholstery must-have is a good stapler. Save your hand the workout and use a pneumatic stapler like the EZE TC-08 Staple Gun. This stapler is lightweight, easy to use, and reasonably priced. It comes in two different models, a long nosed and a short nosed version and both work great for upholstery projects. You will need an air compressor, hose and fittings to operate this staple gun as well. Those fittings can be purchased at your local hardware store. 3. 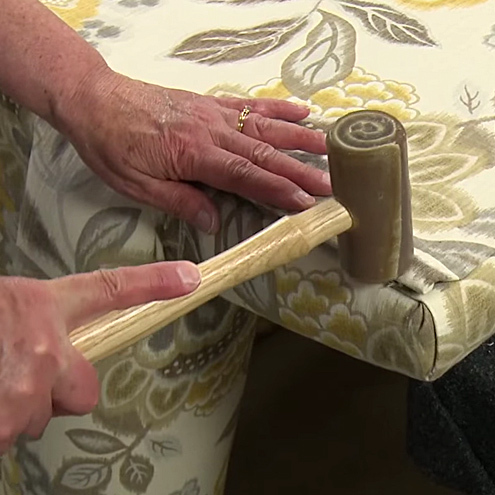 Rawhide Upholstery Mallet: This lightweight mallet is great for hammering tack strips into place. It offers the force needed but also has a soft striking face so it won’t damage your fabric. 4. Tack & Staple Remover: This tool is great for beginners because it pulls double duty. Use the end of the tool to pry up and remove staples. Then use the side teeth to pry up and remove tack strips. This tool works best when used in conjunction with pliers. 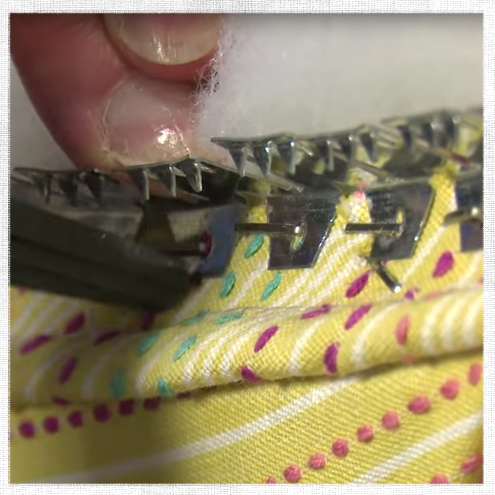 Together you can easily pull staples to remove the old fabric from a piece. 5. Soft Tape Measure: Having a soft tape measure is helpful because it allows you to take accurate measurements around the contours of cushions, armrests and more. 6. Curved & Extra Long Upholstery Hand Needles: The curved needles are used to sew the decking to the chair, slip stitching cushions, and stitching springs to webbing or burlap. The long needles are used to add buttons for tufting and attaching springs to bottom webbing. 7. Straight Pins: Straight pins are so helpful for sewing projects. Use these pins to hold your sewing together or to mark fabric when pattern matching. 8. Fabric Scissors: A great pair of scissors is essential to any fabric project and upholstery is no different. We really like these Gingher Knife Edge Scissors. It can also be helpful to have a rotary cutter, cutting mat and acrylic ruler around as well, especially for making bias piping. In addition to those tools, you’ll need other materials that can be purchased on a project-by-project basis like fabric and trims. However there are a few materials that get used in most projects that we think would be worth keeping around your workshop. Armed with all the right tools and materials you can take on any upholstery project! Ready to get started upholstering? Check out one of our upholstery posts and learn how to recover an armchair, channel back chair, or a recliner. If you want to order all of the materials listed above, check out our easy-to-order Upholstery Tool Kit. You can find all these tools along with thousands of home décor fabrics at Sailrite.com. Upholsterers, what did you think of this list? What tools would you add or subtract? Share your ideas in the comments. Tack strips are the secret to clean, professional looking re-upholstery projects. They are used underneath the fabric to create crisp edges and to secure the fabric in place without visible staples. Sailrite stocks 3 types of tack strips and each with its own particular use. We’re going to show you when and how to use each one. Cardboard Tack Strip is used to create a clean and crisp edge in your fabric when you are blind tacking the fabric in place. In other words, this tack strip is used for places on your piece where you can attach this strip via staples underneath the decorative fabric. This type of tack strip is typically used under the outside arm and along the top back of chairs. Cardboard Tack Strip is also used alongside piping to keep the piping from drooping. 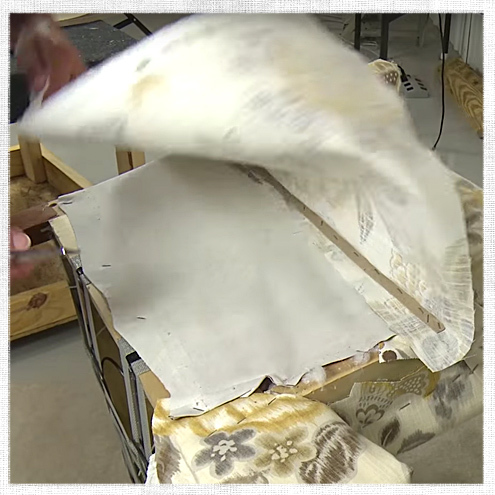 You can see Cardboard Tack Strip being used in our How to Reupholster an Armchair video. 1. Lay the fabric upside down and place the cardboard tack strip along the edge you want to make straight. Staple the tack strip into place. 2. Flip the fabric down over the tack strip. To use cardboard tack strip with piping, push the tack strip up next to the piping cord and staple in place. 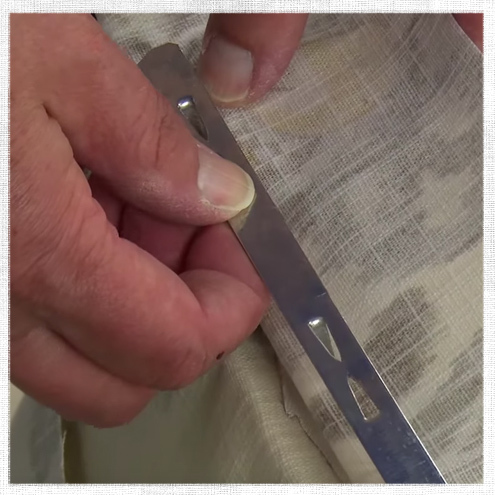 The Upholstery Tack Strip creates a clean, straight edge on upholstery projects and tacks the fabric in place. There is no stapling needed when using this tack strip. This is perfect for areas where you need to secure the fabric but don’t want to have visible staples. 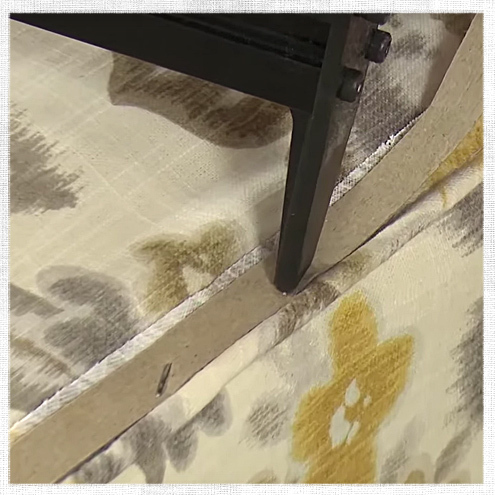 In our How to Reupholster and Armchair video you can see us use this tack strip along the sides of the chair back and on the chair sides. 1. Fold the fabric back along the edge of the chair and crease it. Place the tack strip next to the crease in the fabric. Poke the tacks through the fabric carefully. 2. Flip the fabric over, pulling the fabric taut. Using an upholstery hammer, hammer the tack strip into place. The Flexible Tack Strip is used primarily in curved areas where the other types of tack strips won’t work but where a finished edge is required like on curved arms, outside wings and arched backs of chairs. This tack strip is stapled in place on your chair and then its teeth grip and hold the fabric in place. 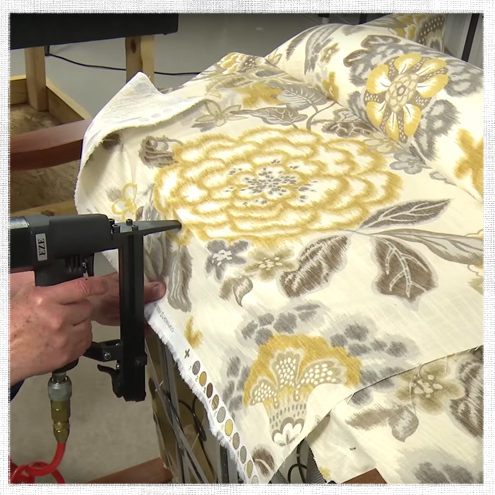 You can see this tack strip being installed in our How to Reupholster a Channel Back Chair video. 1. Staple the Flexible Tack Strip to the chair. Place one leg of a staple in every hole on the tack strip. 2. Tuck the fabric under so the teeth of the tack strip are gripping it. 3. Using a Rawhide Upholstery Mallet start to hammer down the top of the tack strip. Then trim out any excess fabric. Making sure the fabric is properly taut; hammer the tack strip all the way down. 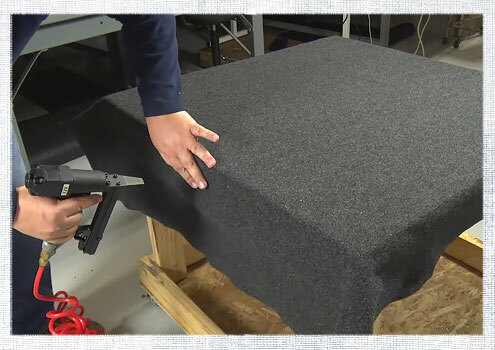 We hope these tips will help you get clean, crisp edges on your next reupholstery project! Be sure to come back to the blog next week because we will be sharing an all new upholstery tutorial–you won’t want to miss it! You can find each of these tack strips as well as other upholstery tools, hardware and fabric at Sailrite.com. If you’re looking into building a dodger or a bimini one of the decisions you’ll have to make is how you want to add additional support to the frame. This additional support helps to tension the fabric and keep the frame firmly upright. The two main options are using a webbing strap or another piece of tubing which is called a rigid support strut. If you’re not sure which one is for you, we’re going to break down the pros and cons of each. The webbing support strap is a strip of webbing attached to the main frame of your dodger or bimini at one end and attached to your boat via a snap hook and a strap eye. The webbing strap is adjustable so you can get a tight, taut fit. Using an adjustable webbing strap is the more affordable option and many people find it easier to break down than a rigid strut. Webbing straps are also lighter than struts, so they save weight on board. A common concern with webbing straps is that webbing is not as UV resistant as the tubing. However, using a highly UV resistant webbing like Sunbrella Webbing can help mitigate this concern. Webbing straps however, are far less secure than the solid rigid support struts. Additionally, some people don’t care for the look of the webbing or the fact that they flap when traveling at higher speeds, like on a powerboat. Rigid support struts are tubing pieces that attach to the dodger or bimini frame with a jaw slide on one end and then to the deck of your boat via an eye end and a mounting plate on the opposite end. This creates a very solid connection and a strong support for your dodger or bimini. Rigid support struts are sturdier and make better handholds than webbing straps. They also provide more consistent tensioning. Using rigid support struts also offers more design flexibility than webbing straps because a pole can push or pull the frame into place, whereas a strap can only pull. This means there are more ways to position a support strut for equal or better support than from a strap. A common drawback for rigid support struts is that they can be harder to disassemble than the webbing straps. If disassembly is a concern for you, rigid support struts can be set up using a flat mount with a quick release pin. This makes the disassembly time about equivalent to that of webbing straps. We recommend using rigid support struts if cost is not a concern because the support is really much stronger. As one of our crew members put it, guests on board will hold on to whatever is handy for them, which is likely the bimini or dodger frame, so having those secure is key. 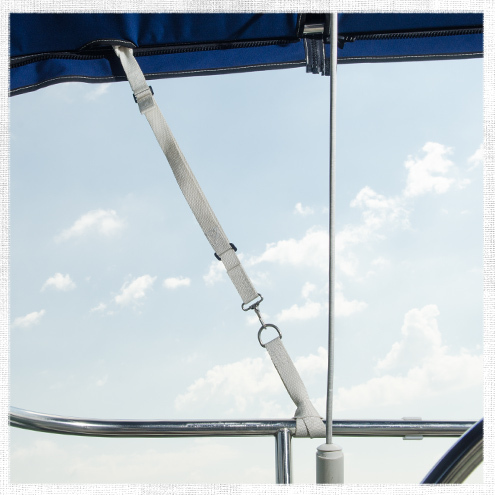 You can find kits to make webbing support straps and rigid support struts at Sailrite.com. 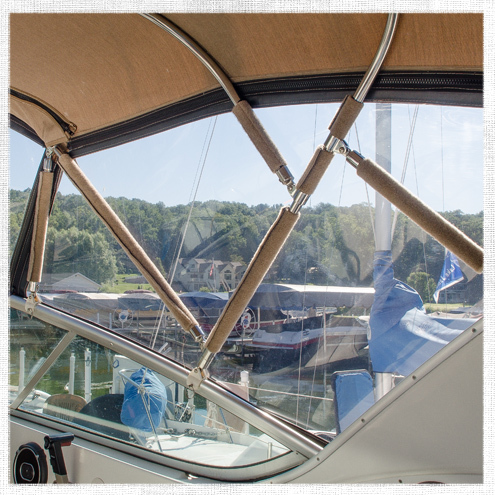 Which do you have on your boat, webbing support straps or rigid support struts? Why did you choose the one you did? Hole cutters are handy tools that help you punch a hole in canvas or sailcloth to install grommets or fasteners. There is a knack to cutting a clean hole and often new canvas workers struggle to use their hole cutters effectively. If you’re having a hard time, don’t worry—it’s common. You can easily master the technique and if you set up your cutting area right, you’ll be cutting like a pro in no time. Here are our three tips for better, cleaner hole cutting. 1. Always use a cutting block. To protect both your hole cutter and your work surface, always have a proper cutting block underneath the fabric you are cutting. We have two cutting block options, one is made from a reinforced plastic and the other is rubber. However, if you will be using the Common Sense or the Lift the Dot hole cutter, you should use the Rubber Cutting Block, as it is better suited to those more intricate cutters. Never use a rotary cutting mat with hole cutters. It is not thick enough to withstand the force of the cutting tool. 2. Use a mallet, not a hammer. A mallet sends the most even force to the cutting tool and will cut the hole in as little as one strike. 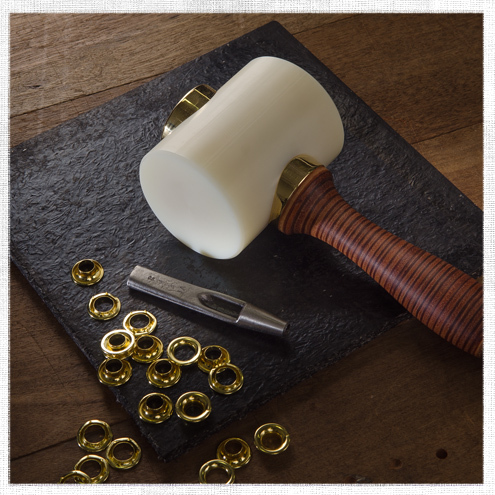 Our favorite mallet for this application is the Barry King Hammer Style Mallet. It works great, looks really nice and was designed by a professional leather and metal worker. If you already have upholstery tools on hand, a Rawhide Upholstery Mallet will also work with your hole cutter. Here’s a quick video that shows the difference between using a mallet and a hammer. 3. Cut on a solid, steady surface. When you go to cut your hole, be sure that your cutting block and fabric assembly are sitting on a solid, sturdy surface. If you hit the hole cutter and your table shakes, vibrates or bounces, chances are you didn’t cut the hole in the fabric either. You need all of the force from the blow of your mallet to be focused on the cutter, not dispersed across the tabletop. If you don’t have a table that is sturdy enough, a concrete floor is a great alternative. We hope these tricks help you to cut holes for grommets and fasteners more easily. If your hole cutter starts to get dull, check out our post about sharpening your hole cutter (it can be done!). You can find hole cutters in various sizes as well as all the necessary accessories at Sailrite.com. Have you ever had troubles with hole cutters? Do you have any other tips to share? Share your experiences and ideas with other readers in our comment section below. Spray adhesives are great for installing headliner, gluing batting to foam, basting sailcloth, crafting and much more. We love how handy these adhesives are, but they also can be really messy. Today we’re going to share our tips for keeping the can nozzles clean and your home or boat clear of sticky overspray. When possible, lay out newspaper or kraft paper underneath the area you will be spraying. This will help keep the overspray off your surfaces. In the Sailrite Loft we have a table with walls on three sides that’s lined with kraft paper to protect our main table from sticky residue. If you are working on a project that doesn’t allow you to paper off your area, like if you’re adding headliner to your boat’s cabin for example, you can easily clean off any overspray with 3M General Purpose Adhesive Cleaner. Use the cleaner on a rag and wipe down any surfaces that might have excess glue on them. 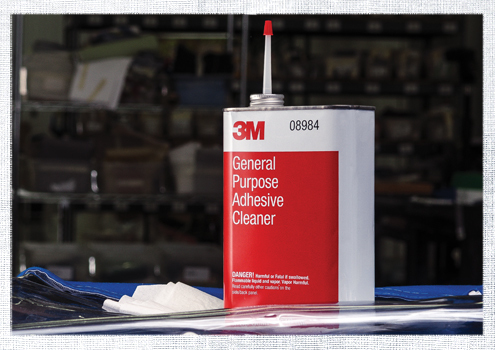 This cleaner is safe to use on dried paint, vinyl and fabric. It’s easy for excess adhesive to dry and block the nozzle on the can of spray adhesives. To get the most use out of your can, you’ll want to keep your nozzle clean. To start, when you are done using the spray adhesive hold the can upside down and spray until just air comes out of the can. 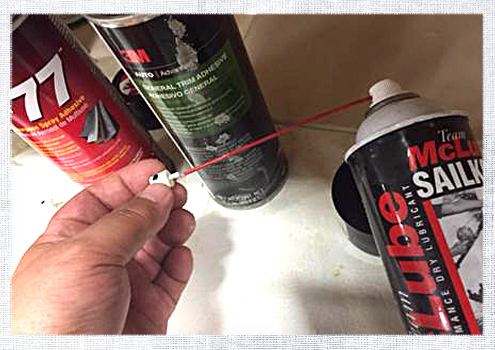 This helps spray out any excess glue that may clog your spray nozzle. If you already have a clog, don’t worry! Pull the spray tip off of the can and soak it in a small pool of 3M General Purpose Adhesive Cleaner or Goo Gone for up to an hour. These solutions should work off the glue residue. Then you can rinse off the tip and add it back to your spray adhesive can. Another trick for this is to remove the nozzle and spray McLube Sailkote through the bottom of the nozzle, like in the photo above. McLube Sailkote is really a dry lubrication, but we’ve found that it’s surprisingly good at removing adhesive from fabric and hard surfaces. Hopefully these quick tips will help you feel more confident using spray adhesives. Shop our selection of spray adhesive for your next project at Sailrite.com. Have you ever had problems with overspray or clogged nozzles on spray adhesives? How did you solve them? Share your experiences in the comments! 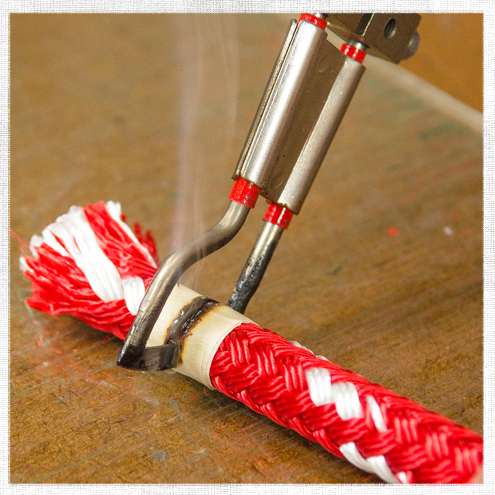 A hotknife is a great tool for cutting rope because it will melt the end of the rope as it cuts, keeping the line from fraying and coming unraveled. If your hotknife isn’t cutting your rope like you’d like, we have a quick tip for you that will make a big difference. The rope on the left was cut through tape. The end on the right was cut without. When you try to cut rope with your hotknife, is it turning the end of the rope into a blob? Sometimes the rope unravels a little as you cut and then melts which creates a mushroom shape. This can be frustrating because the end won’t feed easily (if at all) through blocks, pulleys, cleats and more. How can you prevent this problem? Here’s our trick: wrap masking tape around your rope where you want to cut the line. Then cut through the tape. The tape keeps all the strands together so they melt in a consistent way. With this simple trick your rope end will stay it’s original size for easy feeding. 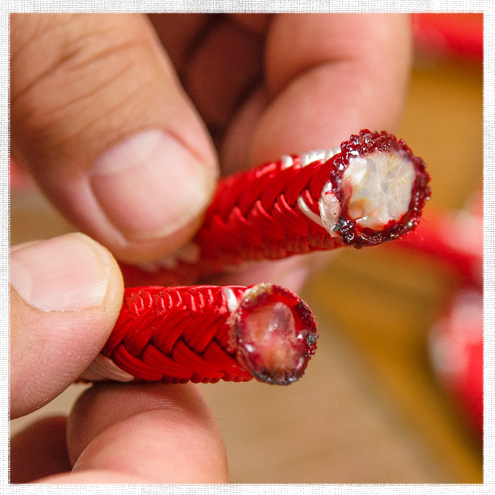 To best ensure your rope won’t fray, it’s always a good idea to whip the ends, even if you use a hotknife. For more hotknife tips, check out our post: What Can You Cut with a Hotknife? Get your own Sailrite Edge Hotknife exclusively at Sailrite.com. Do you have any quick tips for working with a hotknife? Share them in the comments! With any project it’s important to have all the right tools before you begin. One tool that is really helpful when working on re-upholstery projects is a swiveling work table. With a simple table like this you can set your upholstered piece at a comfortable height and turn the table instead of having to awkwardly wrestle the chair around over and over. We built our own upholstery table and we made a video of the process so you can make one too. We designed our work table based on the table our upholsterer, Cindi, uses in her own studio at home. It features a soft top upholstered with Trunkliner fabric, a bottom bay where you can keep your tools, and swivel casters on the bottom for easy movement of the table. This table is a simple build and goes together quickly; it could easily be made in a day. Watch the video for full step-by-step instructions. Once you get your work table built you’ll be all set to start upholstering! We have more great re-upholstery tutorials coming soon, so be sure to subscribe to the blog to not miss a post.